This post has 721 views. 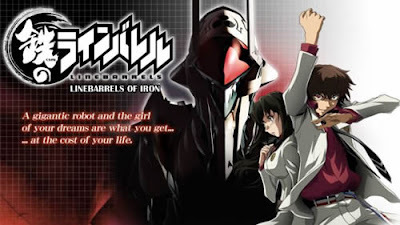 Here is another of my short end-of-series anime reviews (more like a rant this time), and this time it’s for the disaster known as Linebarrels of Iron. Linebarrels of Iron is a mecha anime loosely based on the manga of the same name by Eiichi Shimizu and Tomohiro Shimoguchi and animated by Gonzo. The story of Linebarrels is set in an alternate future and focuses on junior-high student Kouichi Hayase, who is bullied at school and often dreams of being a hero of justice. One day while running errands for his bullies, Kouichi is killed when an extra-terrestrial robot named Linebarrels crashed into the earth from outer space. Kouichi is somehow revived by the power of the Linebarrels and finds a naked and amnesiac girl name Emi Kizaki lying beside him in the crash crater. After the “accident”, Kouichi discovers that he has gained superhuman strength and control of the robot, and he and Emi eventually joins the organization JUDA to fight an advance vanguard of invaders from another dimension. Linebarrels of Iron is set up like your typical shounen mecha series, but it is actually much more (or less) than that and that’s not in a good way. The series stumbled out of the gates primarily because protagonist Kouichi emerged as an annoying, egoistical yet incapable character who apparently has no redeeming qualities. Kouichi’s arrogance and recklessness in the first few episodes made him very difficult to like, and I found myself hoping for someone to come along and teach Kouichi a lesson. Thankfully that happened in the third episode and after that Kouichi’s antics became easier to tolerate. He is still sometimes arrogant and reckless, but on many occasions his behaviour is played for laughs and he did managed to display some real heroics. Other than Kouichi, another questionable decision that stood out at the start of the series is the facial designs and animation of the characters. Perhaps this is a matter of personal taste, but the faces of many of the characters just didn’t look right from certain angles. After Kouichi is humbled in the third episode, Linebarrels looked like it was on its way to being your average mecha series. The next few episodes were by no means great or even good, but it was tolerable and plausible enough (for your average mecha series) to watch. There were bits of random comedy being thrown in, which again weren’t great but nonetheless added some entertainment value. Just when it looks like Linebarrels was on the right track, all hell broke lose in episode 13 when JUDA’s ace pilot Moritsugu killed JUDA’s leader Ishigami and joined the bad guys. This betrayal basically came out of nowhere and there were no prior indication that Moritsugu was a traitor, but one can argue that a sudden betrayal may just be a plot device to introduce more drama and urgency to the storyline. Unfortunately, Moritsugu’s betrayal was just the beginning of whole slew of improbable events including multiple characters switching sides, characters coming back from the dead, and near the end it’s revealed that all the bad guys are actually working towards the same cause of the good guys and the two sides join forces to battle the real bad guys. So basically the story, especially the character statuses, became more and more ridiculous as the show went on, and the only reason I kept watching because there was no point dropping a series past the half-way mark; I have a weakness for mecha series; and also I was curious to see how much more ridiculous will the show become. Moving on from all the senseless side-changing, the final battle in Linebarrels was a disappointment because it was poorly planned out, and the final boss was defeated rather unceremoniously. The battle was also filled with many clichés seen in superpower mecha series, including favorites such as all the supporting good guys voicing their support for the protagonist and sending him their energy for a big power-up. I concede that many mecha series utilize such setups in their big battles, but Gonzo went out of its way to make it obvious and cheesy. That’s all for my rant about Linebarrels of Iron. Of course, not everything was terrible in Linebarrels. The CG action is passable and actually gets better as the series went on, and the mecha designs are quite interesting once examined closely. Despite some redeeming aspects, Linebarrels is easily the worst of the anime series that I’ve been following in the past half year, but one thing that Linebarrels should be given credit for is that it is certainly not a boring series. Instead, it is just really ridiculous and full of clichés. Perhaps the people who produced this series meant it as an off-beat parody to the typical boy-becomes-mecha-pilot shows, but I somehow failed to get that impression. If you managed to watch all 24 episodes like I did, it’s time to give yourself a well-deserved pat on the back.